It’s November and the busy holiday season is upon us. Planning a trip and don’t want to leave Fido behind? Traveling with our pets can be a stressful affair. 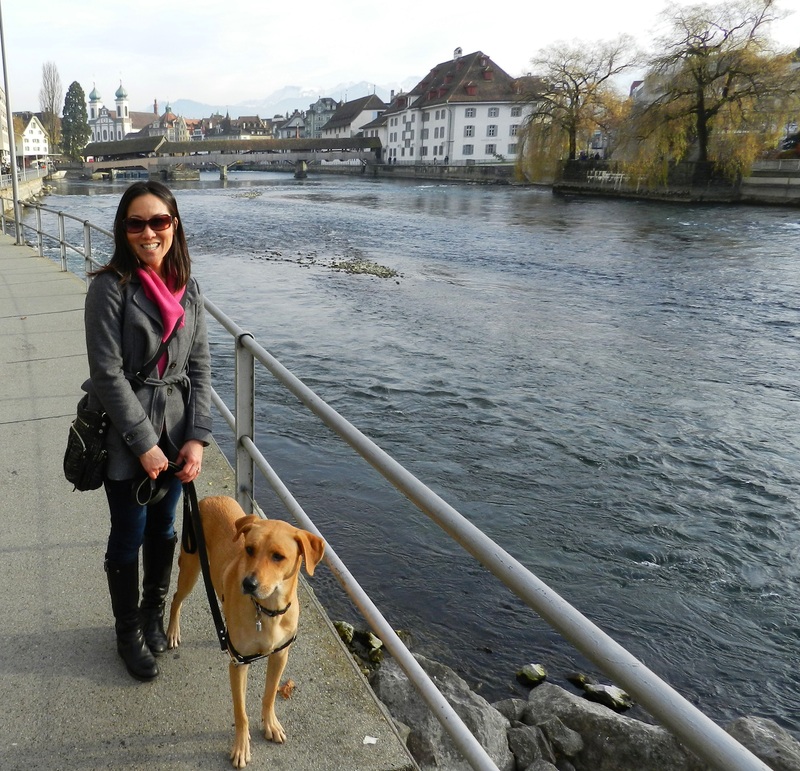 Here are some tips we’ve learned about traveling with our dog, Dunkin. 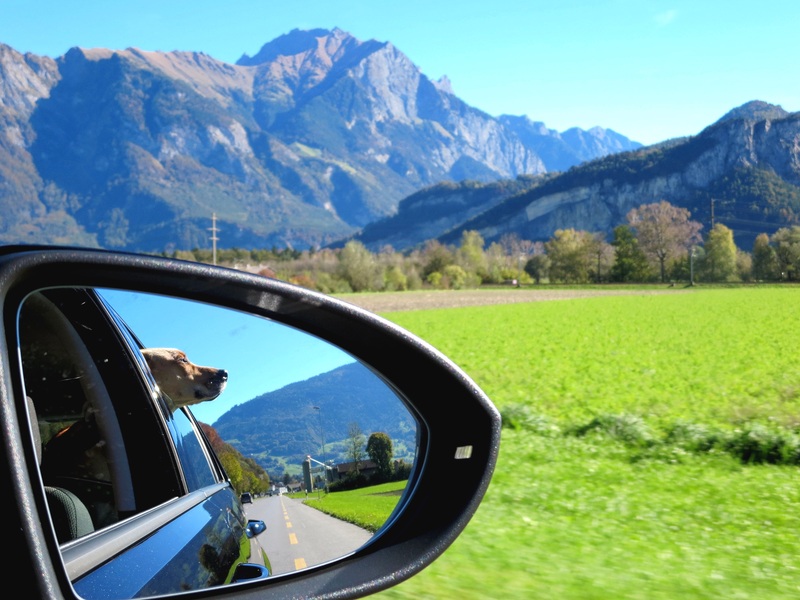 Before any extended trip, make sure Fido gets a checkup from the vet and receives a clean bill of health. It’s also a good idea to note the number of a local vet or emergency clinic at your destination. Knowing this in advance will alleviate some stress if you have to deal with a sick pet away from home. Make sure your pet is wearing an id tag with your phone number and has a microchip. If you’re traveling internationally, check that it’s ISO compatible (International Standards Organization). HomeAgain and ResQ are 2 brands that were recommended by our vet. Dunkin has the latter. Is your dog crate-trained? If he needs to travel by carrier or crate, make sure he is well adapted before your trip. Visit your vet before any extended trip to make sure Fido is healthy – Dunkin loves his vet because he always gets treats! If your pet has a pet passport or vaccination booklet, it’s helpful to have those on hand in case it’s needed. If he’s traveling internationally, he will need health certificates and vaccinations. Please see the section under “Traveling By Plane”. Bring along your pet’s food so he can keep his regular diet. Changing a dog’s food overnight can cause irritation to his stomach and sometimes a bad reaction. 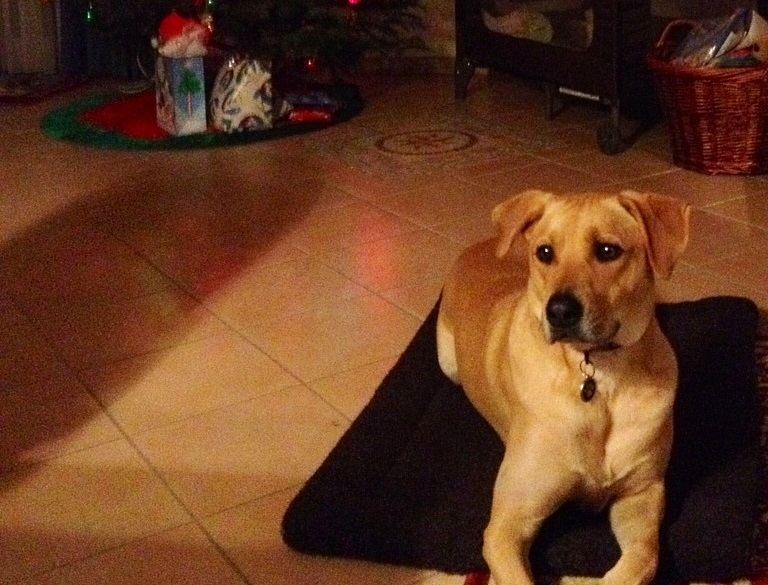 Bring his favorite blanket or toy so he can be comforted by something familiar in a new environment. 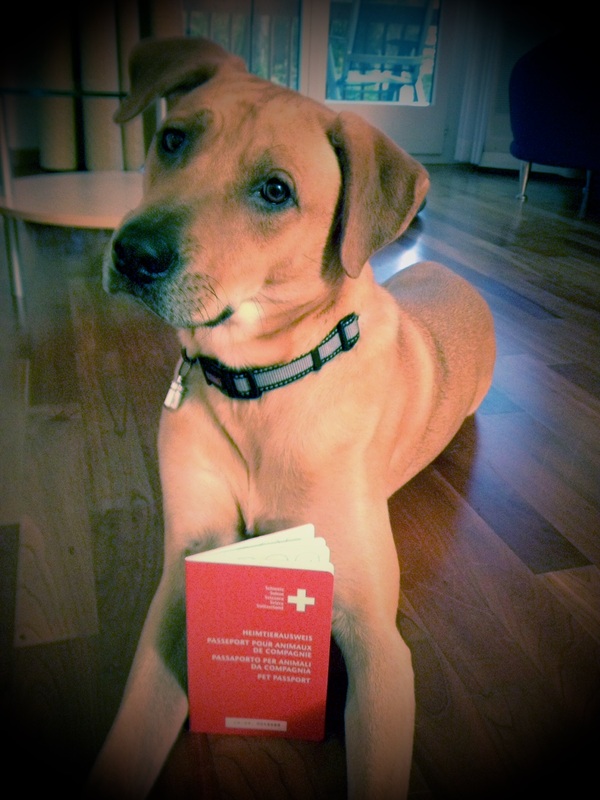 Our dog Dunkin and his Swiss passport 🙂 To date, he has been to 8 countries! When Mike and I relocated from San Francisco to Zurich, bringing 70-lb Dunkin on our flight was a stressful part of our journey. Here are some things to plan for if you’re flying with your pet. Every airline and country has its own regulation and rules. Double check what they are well in advance of your journey. What health certificates and vaccinations do your pet need? Does your country of destination require a quarantine? The USDA site has helpful information about what’s required for each country. Do not give your pet any sedatives or tranquilizers prior to flying – they can create respiratory and/or cardiovascular problems for dogs in increased altitudes. If this is a concern, please ask your vet for alternatives. If your pet is traveling with you in cabin, he must fit in an airline-compliant carrier and stowed under your seat. Check with your airline for specific regulations. If your pet is too big to fly in cabin, it gets a little trickier. He will need to travel in the cargo hold of the plane in his crate. 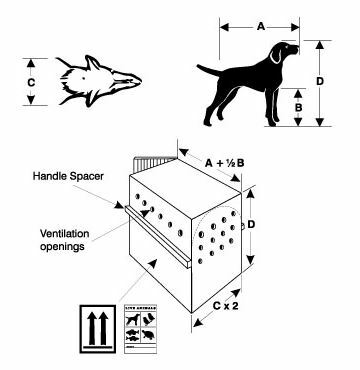 Make sure that (a) he is comfortable in his crate (b) that he is used to being inside his crate – take a month to familiarize him with it if it’s new, (c) that it’s well ventilated and (d) it’s IATA approved. 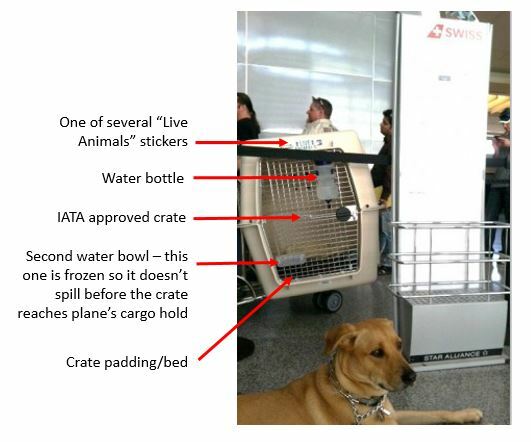 Confirm with your airline whether they have any other requirements for the crate/carrier. 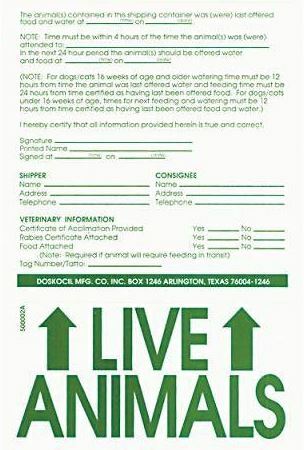 Make sure the crate has the “Live Animals” label, arrows upright, with your name, address and phone number. Place a T-shirt or something you’ve worn in his crate so he can be comforted by your smell, something familiar to him. Leave water for your pet that won’t spill in the crate. DryFur has some great products for pet air travel. If your 4-legged friend is traveling for a long duration, a good trick is to freeze his water bowl prior to your flight, then letting it melt slowly en route. That way, the water doesn’t spill before he is stowed in cargo. Alert the staff at check-in, the captain, the co-pilot, the flight attendants (basically anyone you can) that there is an animal in the cargo hold of the plane so the temperature and pressure can be regulated properly. I’ve heard too many horror stories so better safe than sorry! Always try to fly on the same flight as your pet and take direct flights to your final destination – taking these steps can minimize the chances of him getting lost. Carry a recent photo of your pet. In case he does get lost, the photo will make it easier for airport personnel to identify him. Try not to fly in the extreme heat of summer or cold of winter so the temperature can be comfortable for him. For the safety of you and your dog, it’s always a good idea to crate your dog during road trips, especially if he’s already crate-trained. However, if one isn’t available, exercise caution while on the road. Bringing a Kong toy with treats can help ensure he is safely lying down in the back seat and keeping busy – so he can’t distract you while driving. Getting ready for another road trip! If your dog is prone to getting motion sickness, don’t feed him too much before the trip – it’s better they travel with a lighter stomach. Stop often so he can get some exercise and a bathroom break. Don’t forget to offer him water during the stops. If your dog loves hanging his head out the window, please limit this activity (we are also culprits because Dunkin loves this!) – it’s not safe and he can get something in his eye. Please, don’t ever leave Fido in the car unattended, especially in the summer. Dogs are very sensitive to heat and it can be fatal. Make sure your hotel accepts pets before you make arrangements. If they do, often times they charge an extra fee or have a weight/size limit. 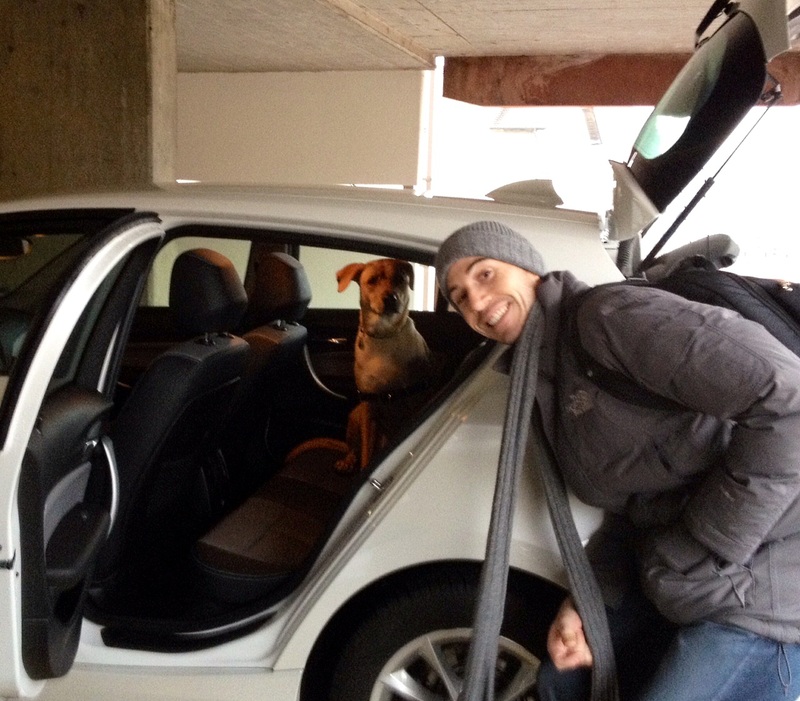 Check before your trip that Fido fits the limit. Help your pet adjust to his new environment by bringing a travel bed or blanket he’s familiar with. 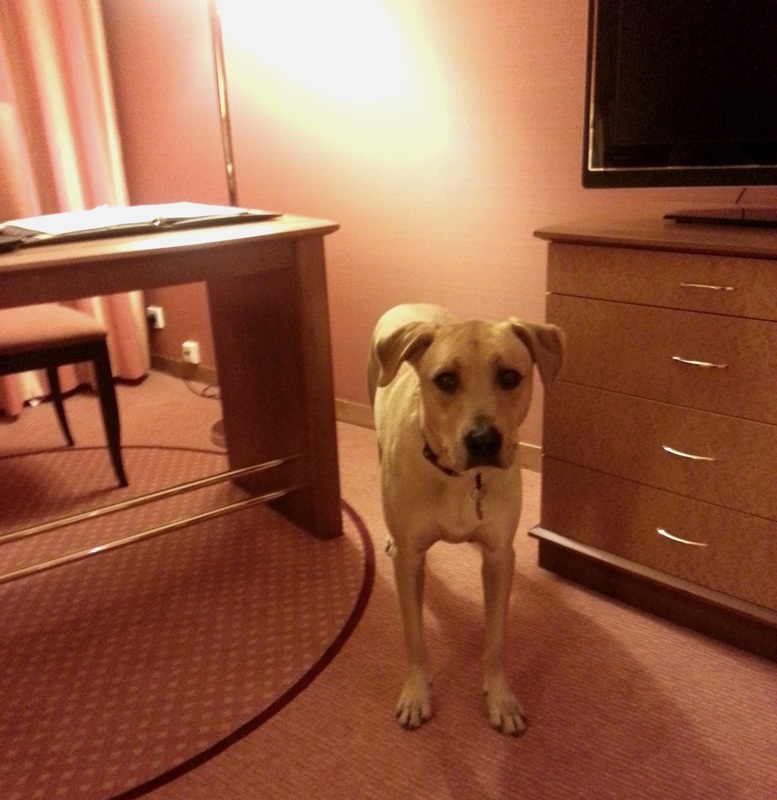 Try not to leave your dog alone in the hotel room – or until he’s well adjusted to his new environment. Dogs may bark or destroy property if they are left alone in a new place. Once you reach your destination, go for a long walk with your dog. Exercise will help reduce his stress and relax him. Let him explore the new sights and smells. It’s natural for him to be nervous at first – be calm and assertive and your dog will follow your lead. Note any dog-friendly places to walk him at night and any potential hazards or foods he can ingest. Traveling with your pet can be fun and a huge reward 🙂 After all, they are family and who wants to leave them behind? Reduce your stress and any surprises if you do your homework and plan ahead. Good luck and happy adventuring with your 4-legged friends!